Shri. Shankar Mahadevan began his career as a playback singer, but soon was embracing Indian classical musics such as Karnatic and Hindustani; Western styles such as classical, jazz and blues; as well as Indian film songs and fusion music. In 1998, his first album as a solo singer found him singing a single breathless song, without a pause or interlude. Mahadevan joked that the lyrics looked more like a newspaper article than a song. The album, Breathless, was a big hit. Since then he has experimented with Indo-pop and fusion bands, co-written film scores. 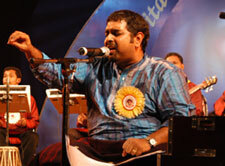 At the time of Amritavarsham50 he had recently released a second solo album, Nine.